I prefer my voltage sources as in the image below. How can I achieve this in circuitikz? There is an identical question here, however for plain tikz. I tried to implement the solution given their, but it does not seem to work in combination with circtuitikz. In fact it generates an error. Not the answer you're looking for? Browse other questions tagged circuitikz or ask your own question. 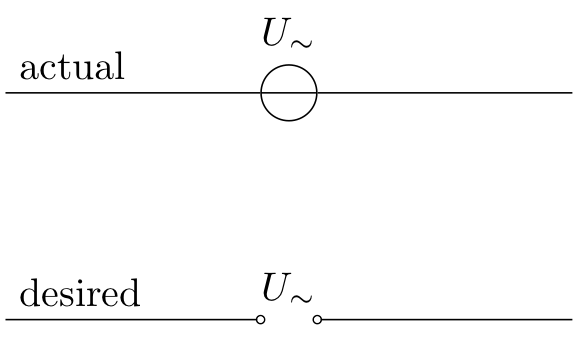 Does a workaround or solution exists for the label conflict of circuitikz and TikZ?